Very Good. 0141036133 ALL BOOKS SHIPPED WITHIN 1 DAY OF PURCHASE! Very Good. 0435121650 ALL BOOKS SHIPPED WITHIN 1 DAY OF PURCHASE! Very Good. 0140008381 ALL BOOKS SHIPPED WITHIN 1 DAY OF PURCHASE! Good. 0141036133 ALL BOOKS SHIPPED WITHIN 1 DAY OF PURCHASE! Good. 0435121650 ALL BOOKS SHIPPED WITHIN 1 DAY OF PURCHASE! Good. 0140008381 ALL BOOKS SHIPPED WITHIN 1 DAY OF PURCHASE! Very Good. 0141036133 enscription on first page. I've read this book before but get to be exposed to it again while our daughter reads it for a class. It arrived for her in very good condition. The book is a reminder to its readers of how easily people can be duped by an idealistic sounding speaker and that it is most important to truly think about the consequences of one's choices personally and to a group. How easy it is want someone or some entity to contribute to one's welfare without realizing the cost of giving up personal responsibility for oneself to a governing entity. 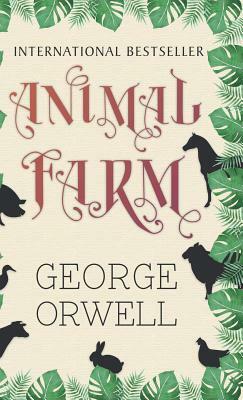 I am very fond of George Orwell but Animal Farm didn't seem quite as good as others. The language was, as always, wonderful but the plot didn't particularly appeal to me; this is despite the clear parallels with Soviet Russia and the vivid descriptions of the animals on 'Animal Farm'. Nonetheless, it was a short and pleasant read. Orwell's disappointment with Stalinist Russia resulted in a fine book, one that I will use with my junior high class. To quote a former president, "The government isn't the solution to our problems, it is the problem." If you want a classic allegory that is as timely as ever, "Animal Farm" should be read or reread today. I actually thought this book was very well written and thought out. I even enjoyed it although I wasn't sure at first. I cannot recommend it to anyone though, unless you really know what you're getting yourself into. Filled with a plethora of subliminal meanings, this book will have you thinking. Picture the farm as a region ruled by the farmer; the animals are the population and each have different political views. Some take on democracy while some take on tyranny. Enjoy the revolution.